When you meet with Dr. Charles A. Porter III at his office in Charlotte, you can expect the very best in advanced cosmetic, general, and restorative dentistry treatments that improve dental health and the appearance of the smile. In addition, our team will share tips that can help your smile stay healthy and look lovely for years to come. With the idea of prevention and at-home dental care, we'd like to consider the issue of tooth erosion, what it is, and what can be done about it. Tooth erosion refers to the weakening and damage of the enamel layers of the teeth caused by an acidic oral pH. The condition is also known as dental erosion and acidic erosion. Left untreated, tooth erosion can lead to the loss of a patient's tooth enamel, causing teeth to become weaker, yellow in color, stubby or shorter, and more like to to chip, crack, or fracture. Tooth erosion can also increase chances of root canal infection, which can lead to major dental health and general wellness problems down the road. How does tooth erosion differ from tooth decay? While many people think tooth erosion and tooth decay are the same thing, the face of the matter is that these are different conditions. While tooth erosion is caused by acidic oral pH, tooth decay is caused by a substance known as plaque which is produced by oral bacteria. This plaque clings to the teeth and eats into the tooth structure, causing cavities to form. With regard to gastric fluid, this is simply a term for the stomach acid and other substances in the digestive tract that aid in digestion. Tooth erosion is often a common sign of alcoholism and bulimia. If you should notice any warning signs of bulimia and alcoholism as well as yellowing of a loved one's smile or other dental problems, be sure to intervene and help your loved one receive the professional help that he or she needs. 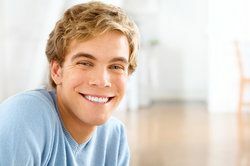 When it comes to treating tooth erosion, the most common treatment options involve the use of dental restorations (i.e., fillings, inlays, onlays, crowns) to rebuild the compromised or damaged enamel. The type of restoration that's ideal for you will be determined by the nature and extent of the dental erosion. In serious cases of tooth erosion, a tooth may not be able to be saved. In these cases, the ideal option is often tooth extraction and replacement of the tooth with a bridge or implant-supported crown. To learn more about tooth erosion and the treatments available for other kinds of serious dental problems, it's important that you contact our cosmetic and restorative dentistry center today. Dr. Charles A. Porter III and his entire team look forward to your visit and helping you achieve all of your dental care goals.